Commissioned by Pixelheaven.tv, our LA office co-produced this video of Armin van Buuren and Trevor Guthrie. They’ve supported Pixelheaven.tv by hiring and managing film crew and cast, location scouting and developing the operation plan for filming. Also they’ve managed the permit process and secured all permits through the County of San Bernardino Film Office, made sure all insurance requirements were met, rented and insured over $200,000 worth of film equipment, and took out a $1,000,000 policy on the Mustangs Ford lent us for the shoot. 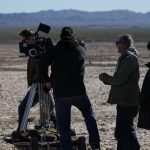 This video was shot in three days, in various locations in and around Amboy, CA and Newberry Springs, CA.